The planet Cybertron was once considered a shining beacon of high culture, progress and technology. But such grand achievements had not come without a cost. The Cybertronian underclass, severely demoralised through its exploitation by the all-powerful aristocracy, finally acquired a voice with the emergence of an idealistic and charismatic leader: Megatron. However, millions of years of civil war had laid waste to the once beautiful planet. Megatron's efforts to address society's wrongs ultimately spiralled his world into utter chaos. A once proud people had degenerated into a scattered mess of warring, barbaric tribes. Megatron had succeeded at weeding out society's cancerous elements - by destroying society altogether. In the midst of this tragedy, a shining glimmer of hope presented itself. 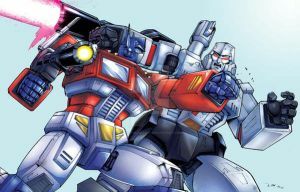 A young archivist named Orion Pax, who by virtue of the Autobot Matrix of Leadership became the titanic warrior Optimus Prime, set out to stop Megatron's relentless quest for power in the hope of reuniting Cybertron's distointed factions and at long last starting a new era of peace and prosperity for all. Lines by me, colours by the absolutely BRILLIANT Phil Knott! This is an amazing image. Hey Bonita, I agree. What would Optimus be without a strong woman on his side? Awesome! Megatron looks very evil! Cybertron looks fantastic. Great colouring.